Researchers at The University of Toledo are investigating what makes us itch. Dr. Ajith Karunarathne, assistant professor in the UT Department of Chemistry and Biochemistry, and his research group recently completed a collaborative, interdisciplinary study of the body’s itch response. Led by Dr. Zhou-Feng Chen in the Center for the Study of Itch at Washington University School of Medicine, researchers explored the cell’s sensory neuron response to itch-inducing stimuli. 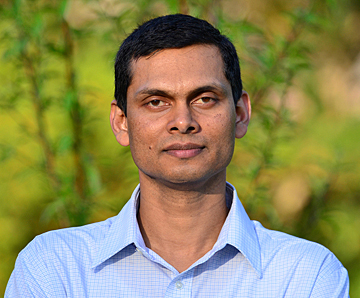 Karunarathne’s research group was selected to participate due to its expertise in subcellular optogenetics, which is live cell imaging and signaling. Imaging fluorescence biosensors help to capture activities in various cellular compartments. However, scientists do not have a precise way of controlling signaling activities in these subcellular locations. In the body, a cell’s transient receptor potential (TRP) channels transmit the sensation of pain, itch, temperature and touch to the brain. One channel, named TRPV1, responds to histamine signals, and another channel, TRPA1, responds to the itch-inducing chemical chlorquine. Using their confocal subcellular fluorescence resonance energy transfer techniques, Karunarathne and his colleagues at UT were able to extract data that helped the team to identify a third member of the TRP family that also plays a role in the body’s itch response. This new discovery could lead to new pharmaceuticals that target TRPV4 to provide relief to chronic itch. The team’s work was published in Science Signaling online last month. This entry was posted on Friday, August 19th, 2016 at 3:29 am and is filed under Natural Sciences and Mathematics, News, Research, UToday .